Join us for Vacation Bible Camp! Our Religious Education Program teaches our children the foundations of our faith in preparation for receiving the Sacraments and leading a Christian life that is full of the joy of faith in Jesus Christ. Children from Kindergarten through junior high meet on Sunday at 10:00 - 10:50 a.m., right here on our church campus in the Greystone Building (see schedule). High school age students preparing for the Sacrament of Confirmation meet on select Sundays. Go to the "Sacraments" tab and select the "Confirmation" page to see further information, as well as the Confirmation and Youth schedules. We use "WE BELIEVE" program by Sadlier from K-8. This program will help us to Learn, celebrate, share and live our Catholic faith. We are on a journey to continue to grow as a disciple of Jesus Christ. "Parents have the first responsibility for the education of their children". 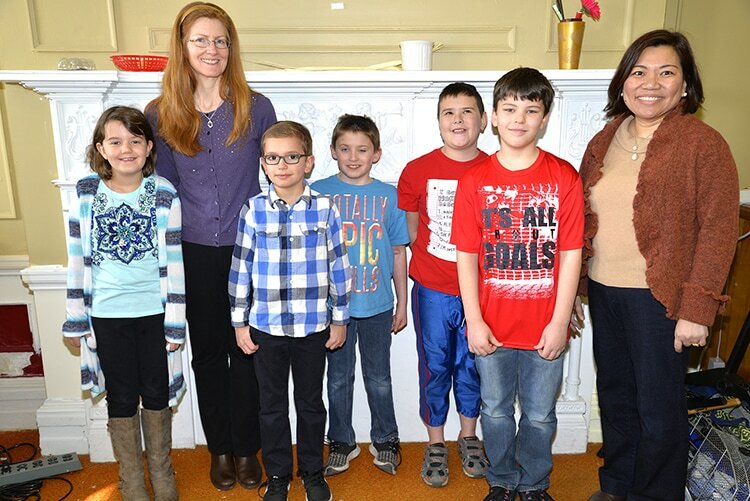 Volunteer parents of the parish are the vital core of our Religious Education Program. Parents are encouraged to participate in the Christian Formation of their children at home and church as fully as possible. Children must be registered to participate in the parish Religious Education Program. A registration fee of $30 ($50 for 2 children, $70 for 3 children) helps to defray operating costs including curriculum and supplies. No family is refused because of inability to pay. Please speak with Sister Angelica, Religious Education Coordinator, 315-782-6750, or Fr. Steven Murray, our Pastor, 315-782-2468, if you need tuition assistance.